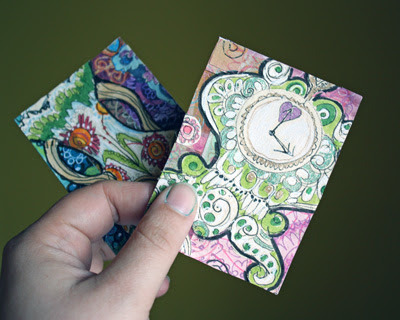 Join us for our monthly workshop to learn new techniques for making Artist Trading Cards (ATCs). Each month we will learn a new technique and share cards we've made and/or received. Then we'll spend some time making some miniature works of art in a fun and relaxed environment. This month -in honor of Earth Day -we will be experimenting with different 'mark making' techniques to beautify junk mail. Mark making is a term used to describe the different lines, patterns, and textures we create in a piece of art. For inspiration, check out Rae Missigman or Carolyn Dube. We will have so much fun! Invite your friends. If you plan to come, please mark the 'Going' box so that we will have ample room & supplies for everyone!